Filmed by Bike specializes in super short bike movies from around the world, but we also love to live on the edge and bend our own rules. Sometimes you find people in the most unexpected of ways. A team of bikers sets out by bike for the Gaia Festival. An expert in bicycle law, Attorney Ray Thomas showcases what not to do. A community of cycling enthusiasts in Vancouver, Canada, finds funky ways to bring together their environmental and artistic ideals to promote green transportation and alternative ways of engaging within a car-congested society. A visual dirge for bikes abandon on the streets. 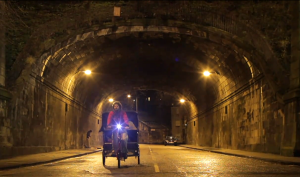 A rickshaw driver with bad knees makes brief but powerful encounters with buskers, drunks and potential passengers on his last night in Edinburgh. BMX trick rider Matti Hemmings shows off his mad skills. What happens when bikes go bad? Most people tremble at the idea of riding a bike in the winter. 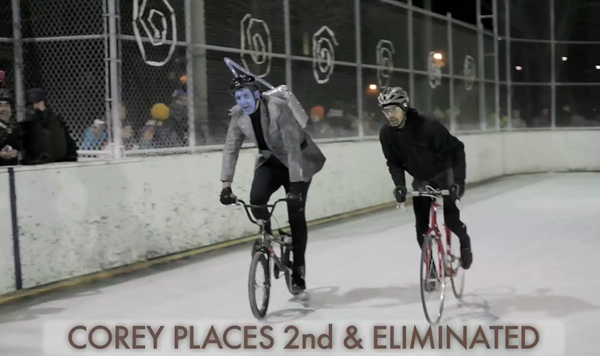 For several dedicated Toronto cyclists and bike messengers, winter is a time to relish in the ice as they showcase their biking dedication. For nearly 20 years, Toronto has been the scene of North America’s only bicycle ice race in a closed velodrome style circuit – otherwise known as an ice hockey rink.